Thousands of Stop & Shop workers in Rhode Island and across New England are on strike for a fair contract. 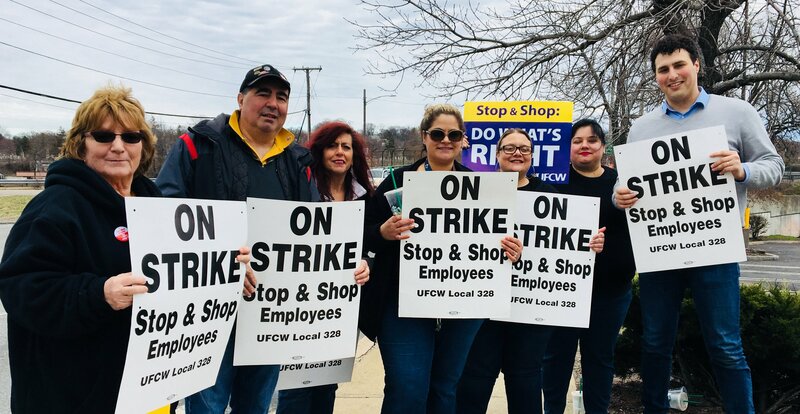 I ask you to join me in standing in solidarity with these hardworking Rhode Islanders by honoring the strike until Stop & Shop offers its employees a fair contract. I visited three store branches in Providence to speak with striking workers, and I was inspired by their united, brave commitment to stand up for themselves and their families. These are mothers, fathers, and professionals - many of whom have been loyal employees of Stop & Shop for 20 or 30 years. Yet right now they are facing draconian cuts that threaten their basic economic security. Stop & Shop's parent company made over $2 billion in profits last year, and recently received a $225 million tax cut from Trump. Yet they are demanding that their workers accept deep cuts to their pensions, health benefits, sick days, and take home pay. It's simply not right. American workers are struggling with stagnating wages, while the wealth of those at the very top continues to increase exponentially. That's what this fight is about. And that's why it's so important we back our fellow Rhode Islanders until they secure the fair contract they and their families deserve. "We really decided there had to be a labor action and stand up to this corporate greed." Some 31,000 workers walked off the job at Stop & Shop stores across New England Thursday in response to the company cutting wages and benefits, a strike that prompted the support and praise of prominent Democrats and left wing activists. The strike is the result of a March vote by store union members to walk off the job if a fair contract between the union and the grocery corporation could not be reached during negotiations. Even though the labor action was not unexpected, the size of the strike was notable, as HuffPost reporter Dave Jamieson pointed out. A strike of 31,000 workers is large by any measure, but it is particularly large in the U.S. private sector, where massive work stoppages have become increasingly rare. Excluding the wave of public-sector teacher strikes and a walkout at California public hospitals, the Stop & Shop strike appears to be the largest since 36,500 employees at Verizon (which owns HuffPost) formed picket lines in 2016, according to data from the Bureau of Labor Statistics. Leaders from the United Food and Commercial Workers (UFCW) union, which is representing the striking workers, pointed to the company's attempts to raise healthcare cost buy-ins by workers and cut pensions as two sticking points in negotiations. Stop & Shop owner Ahold Delhaize, a European grocery conglomerate, is withholding financial information that would justify those cuts, union leaders said in a statement. "The company is claiming the proposed cuts are necessary but is unlawfully refusing to provide financial information to verify that claim," UFCW leaders said. Stop & Shop, in its statement on the strike, said that the company was "ready to meet with union leaders any time" to resolve the dispute. "We are committed to good faith bargaining and hope to reach new contracts as quickly as possible that both recognize and reward the great work of our associates and enable Stop & Shop to compete effectively in the rapidly changing New England grocery market," the company said. Workers outside the Stop & Shop in North Adams, Mass., told reporters from local outlet iBerkshires that the company's refusal to use a fraction of its massive profits to help workers—and the subsequent decision to attempt to cut benefits—was the main issue. "We really decided there had to be a labor action and stand up to this corporate greed," said North Adams union steward and strike coordinator Bill Laviolette. "They wouldn't show us where they were losing money or why they were making such drastic cuts," Laviolette added. Sen. Elizabeth Warren (D-Mass.) echoed her constituent Laviolette's call for fair treatment. In a tweet, Warren said that she backed Stop & Shop workers in their action. "I stand in solidarity with UFCW for these hard-working families to be treated with the dignity & respect they deserve," said Warren. Sen. Bernie Sanders (I-Vt.) also expressed his support for the strikers. "I stand with UFCW workers in their fight to protect health care and workers' rights," said Sanders. Both Sanders and Warren are running for the Democratic nomination for president in the party's primary next year. The strike appears likely to continue for the foreseeable future, until one side gives in—and, as HuffPost's Jamieson put it, in a tight labor market, the advantage is with UFCW and the workers. "They've been investing in infrastructure here but not in the workers," said North Adams' Laviolette. Stop & Shop will need to make a decision: either invest in people power or continue to lose money.